I like the simplicity- I don't know if I could handle the multiple POVs of LotR right now! Beorn has a rad set-up that would put most modern day "preppers" to shame- but of course, he has forest friends to help him. 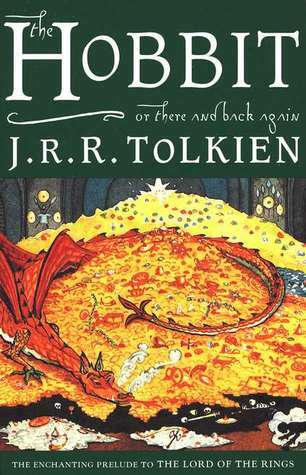 Yes, I hope you get to read the Smaug/Bilbo conversation soon! Thanks for stopping by and chatting, Greg! I really enjoyed The Hobbit as well. I admit I am a bigger fan of The Lord of the Rings, but I do love the world Tolkien has created. His opinion should never matter when it comes to books, because my taste is much better. :P I really enjoyed The Hobbit (you may have noticed from my review). I agree with you on Tolkien having a non-Narnian theme- because he was so interested in Scandinavian/Norse lore, a lot of his seem to have fairly new-age-y themes (if you get what I'm saying). The Hobbit has altruistic themes, but also a touch of hedonism. Go for a reread! It's worth it! Thanks for stopping by and commenting, Rachelle! Yes, it is! It was just the sort of adventure story I'd been wanting to read too. It's a shame that I dragged my feet so long before reading it. Thanks you, and thanks for stopping by and commenting, Jamie! Yes! The more well "loved" a book, the more I want to read it. I tend to keep an "original" copy of my favorite books, and a pretty copy of it- the pretty one is for display, the original is for reading. I think The Return of the King outranks The Hobbit for me (they are both five stars, but even among five star books there is a hierarchy). I feel very weird rating a book five stars when it has absolutely no female characters, but that's just how I felt about it! Thanks for stopping by and sharing, Wendy! I'm so glad you enjoyed this! I watched the movie before I read the book and I'm actually very glad that I did, just so I could get the story down. When I read Lord of the Rings, I had the same issue with keeping everything straight in my head due to the flowery language. I love that you mentioned that Smaug wasn't really the 'villain' in the book! I'm so glad that Tolkien decided to portray him as just another dragon instead of being the epitome of evil. I feel like that isn't done enough in literature. Gah- it seems I must've overlooked your comment on this Laura- I'm sorry! Yes, I was so glad to have him be a relatively neutral villain, since Smaug and I have some similarities. Haha I can definitely identify a bit with Smaug as well! I love villains like that.